After four decades of service to Sam Houston State, Robert Dunning will retire as university registrar at the end of June to pursue another career opportunity. Robert Dunning (left), Barbara Corbin and David Payne relax prior to one of the many commencement exercises in which Dunning has participated in his 40+ years at Sam. "I'm going to start working with the National Student Clearinghouse as a consultant and will be the South Central regional director," Dunning said. Dunning will begin working with NSC, which is based out of Herndon, Va., on July 1 but will not have to relocate to work at the non-profit organization. NSC is the nation's largest source for post-secondary student degree and enrollment verification and represents 91 percent of the nation's enrollment. SHSU has been more than a workplace to Dunning, who came to the university in 1961 as a student and graduated with a bachelor's of business administration degree. Dunning said he also did some graduate work at the university but never completed his master's degree. "I went to Houston for approximately two years to work as an accountant for Penzoil, and then I had the opportunity to come back," he said. "All of my career employment has been in the registrar area." According to Dunning, his long-standing relationship with the university and his co-workers will be two of the things he will miss the most about working in the Registrar's Office. "My wife attended and graduated from Sam Houston, as did our son," he said. "Huntsville and Sam Houston have just been our home. We've enjoyed all of the friendships, and I've enjoyed the working relationships with everyone on campus. That has always been one of the main things about Sam Houston." 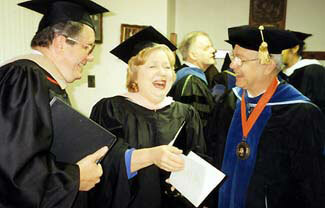 While at SHSU, Dunning has received the Staff Excellence Award in 2000. He has also served on the convocations committee, as an ex officio member of curriculum committee and a two-year term as vice president for registration and records for the Texas Association of Collegiate Registrars and Admissions Officers. "All of us who work for Sam Houston State University like to hear from students and parents and others with whom we work that ours is an unusually warm and friendly campus-that we are willing to go out of our way to help those we are here to serve," said one co-worker after Dunning received the Staff Excellence Award. "To put the case for Robert Dunning most simply, he is one of those key employees who has made a giant contribution to that institutional image." Faculty and staff will have the opportunity to say goodbye to Dunning at a reception on June 25, from 2 p.m. to 4 p.m. in Austin Hall.